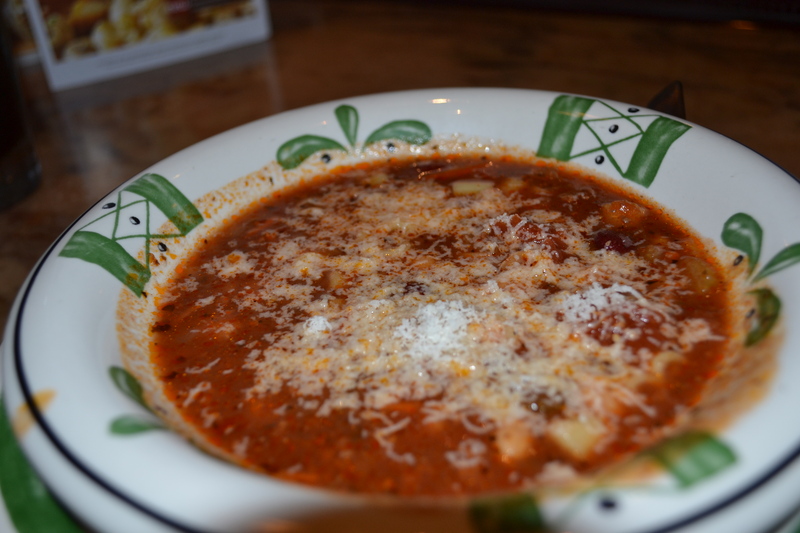 Today I decided to take a break from pasta and try all four of the Olive Garden’s soups. Marty the bartender has been my pasta pass guru throughout this process, and when I asked, she told me this was definitely possible with the pass. I really appreciate how supportive she’s been throughout this whole experiment since it’s a lot of work for her, so as far as I’m concerned, we’re in this together. The chicken & gnocchi soup was much better than I expected – a little on the salty side, but really good broth with a good amount of chicken and dumplings. 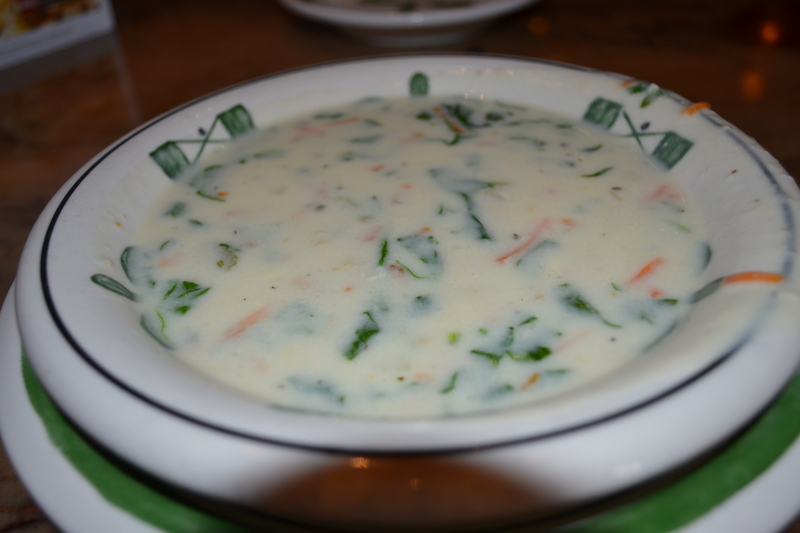 This is now my second favorite soup at the OG. You knew this was happening. 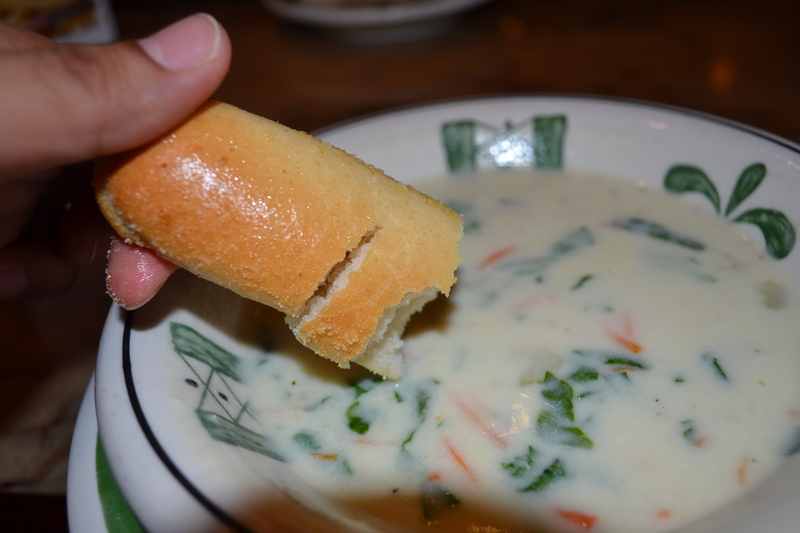 Marty actually warned me to chill out on the breadsticks if I wanted to make it through all four soups, so I decided to tear my first breadstick into four pieces. 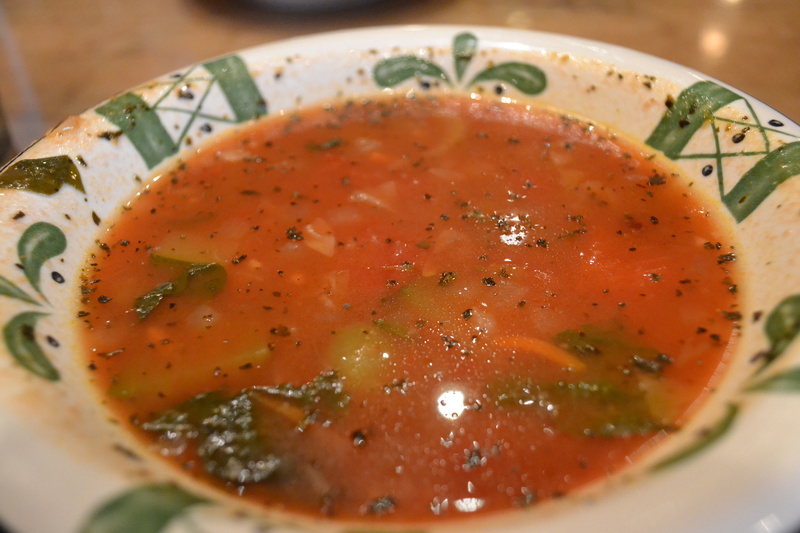 Next up – minestrone! Again, a bit on the salty side, especially for a vegetable soup, but the vegetables themselves were awesome. Voluptuous peeled tomatoes, squash, lots of beans, overall a very hearty and satisfying affair. A touch less salt and I would get this all the time. 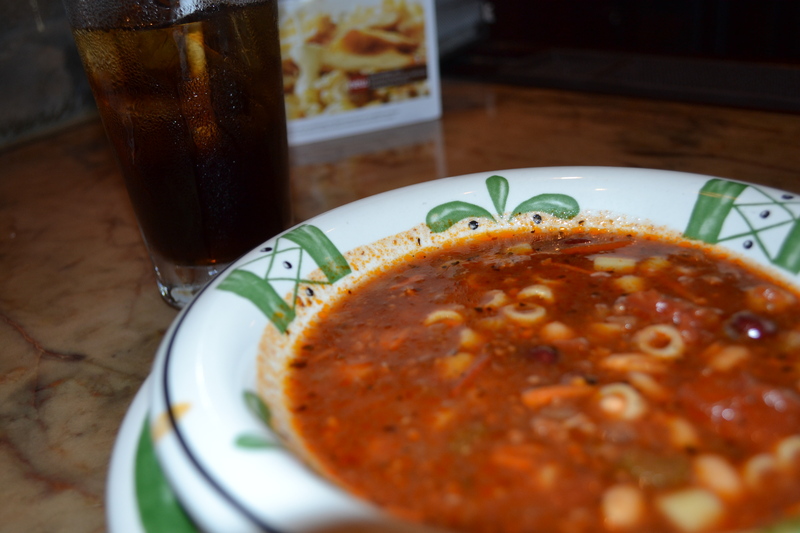 At least in a universe in which the chicken & gnocchi and the pasta fagioli didn’t exist. 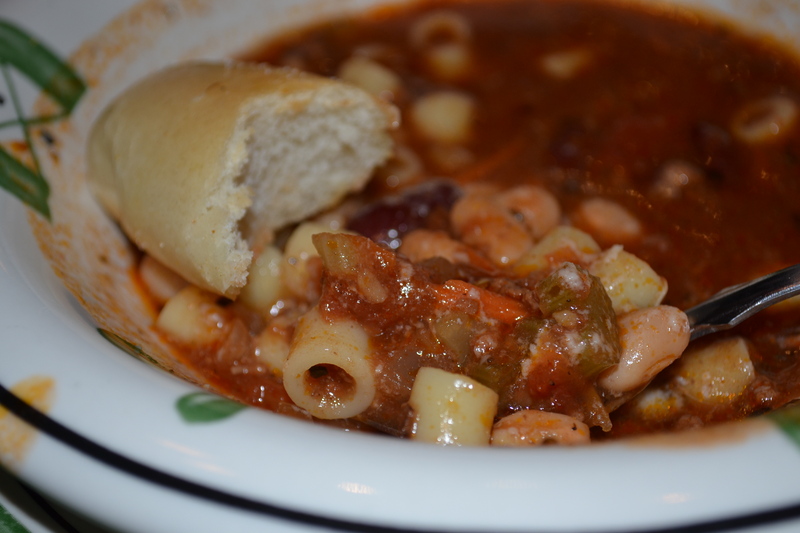 I was going to save the pasta fagioli for last, but Marty called pasta fagioli’s number over the radio, and out it came. 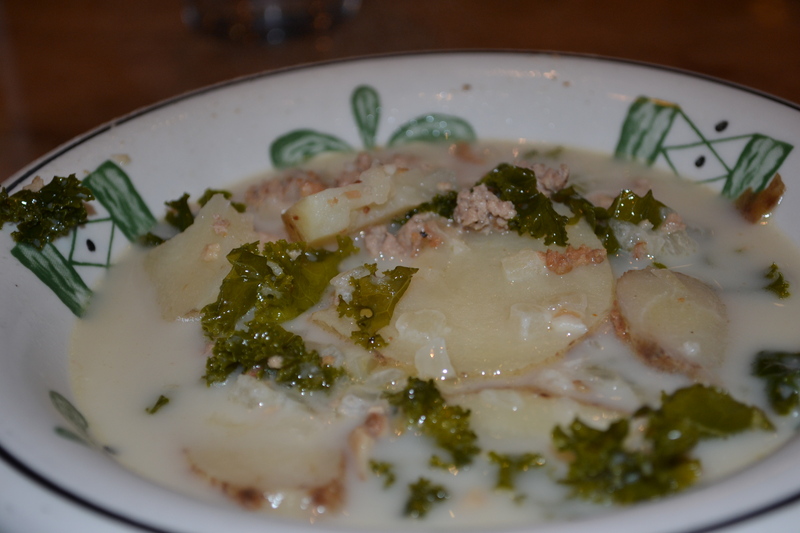 One of my all time favorite soups, and one that I make at home all the time with this recipe. As usual, it did not disappoint. Can’t forget the cheese. There was a new girl working the cheese machine, and she very responsibly stopped after grating a reasonable portion of cheese into the soup. I politely asked her to continue. Then I made a fatal mistake. 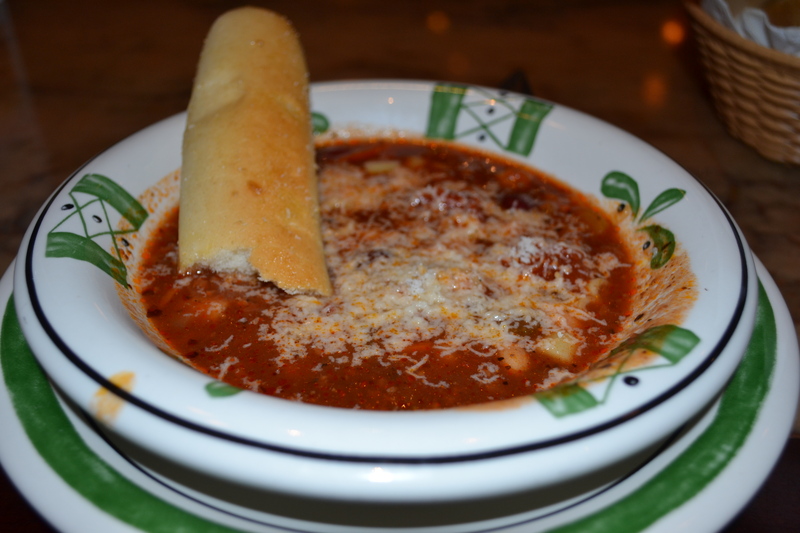 It’s impossible for me to eat pasta fagioli without breadsticks, so I dunked the rest of the breadstick into the cheesy goodness. How could I resist? Look. At. That. Goodness. I wonder if they would ever let me just hold on to one of their cheese machines for the entire time I’m there. With what looks like an entire potato in it. Turns out Marty knew exactly what she was doing. This wasn’t a soup, this was the boss battle that I didn’t even realize I was in for. This was Mike Tyson in Punchout, M. Bison, and Goro, all rolled up into one, brutal, starch-armored monstrosity of a gatekeeper. Okay, I’m being a bit dramatic. I finished it, although I can’t exactly say I felt good about it afterwards. I didn’t respond, but the attitude that some diners display when they’re at a sit-down restaurant is something that bothers me on a really deep level. First, be grateful that you live in a country where, for less than an hour’s worth of minimum wage work (in most states), you can sit down at a nice restaurant and have UNLIMITED breadsticks, salad, and soup, all served to you as if you were royalty. Second, appreciate the fact that there are human beings making your salads, ladling your soups, and brushing your breadsticks with butter – restaurants are not a magic show where food just magically appears. Needless to say, the women did not leave a tip. Which leads me to my next point – if you want to know what someone is really like, notice how they tip, because tipping is really about power, and people reveal who they really are when they have power, even if it’s just a little bit. Just because we live with a convention where diners have the power to determine their server’s wages doesn’t mean that you should be sitting there keeping score of how long it takes to get your drinks or your appetizers, just hoping for a mistake so you can justify leaving a smaller tip. Outside of gross displays of incompetence or outright discrimination, just leave your server 20%. Price it in when you decide whether to go out or not. If you don’t feel like tipping, just go to Chipotle! Or Popeyes! Those places are awesome, and you don’t have to tip. The only reason you think you have some high moral ground to cut someone’s pay when the service isn’t perfect is because you legally can. If you really want to make a statement about bad service, try not paying your Comcast bill when they give you horrible service. If you’re someone who routinely under-tips, then I hope you have Comcast. Noodles in soup DO NOT count as pasta!! You need to go eat pasta tonight or your blog is going to be ruined! !